Okay peeps.. time to wipe away your sian looks. Maybe this liao jiao here shall crap a bit and update you guys out there about what has happened so far =). So? With the pass down of VE 12th committee, what on earth has happened to us? "Little black, yellow riding hoods... XD"
On 3th April, we just had our first choral exchange with Consonance - a choral group that was previously the NYJC choir alumni, now led by Mr Greg Chen and Mr Benedict Goh. To me, it was a really fun experience.. especially the games part where we have to play "Murderer" & "Cat and Mouse". Then comes the learning of song part where we sang Gavotte! The blending of parts was really nice when both ve and consonance sang! Goshgoshgosh.. I'll definitely look forward to collaborating with them in their annual concert this year? Let hope Mr Ong and new committee manage to 'convince' them? So what's the new comm busy with? We'll be performing but not sure of the slots.. maybe new comm will update about this. If you miss us during club crawl, don't worry! Just come for this! 3) Meet US and new people like U! If you're still hestitate about joining us, do feel free to come by for this and our first practice on 28/4 to experience how it's like to be part of us! Kkk.. its just not about singing. We've very sporty people... can meet for swimming/exercise every week one can.. Sometimes even so siao about singing that we go Kbox. Mr Ong even joined us recently! Goshgosh.. listen to his voice can melt man.. Someone.. upload the video here! hahaha.. If you think that we're some boring choir group, you're wrong. Music without harmonies can be real boring sometimes.. Sing with us and understand why chords can be so great that they give goosebumps. 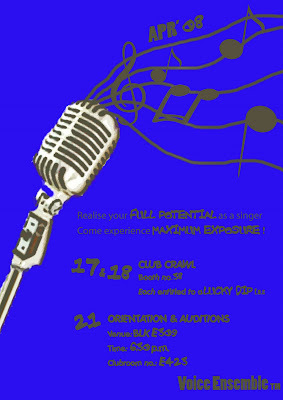 You don't have to be a pro vocalist/experienced chorister to join us. If you've the passion but is afraid to let it out - don't worry..
Cos through singing, we bond =). Don't sing alone in toilets! You've many people to sing loudly with you when you go home - not caring about how crazy you are. Got parts somemore! Hey new comm! Jia you for VE okay? That's all for now! Ganbatte!